This obligate nest parasite once followed wandering herds of bison to feed on the disturbed ground where the buffalo’s heavy hooves broke up the prairie sod. Cowbird young survived even when the bison moved on because the cowbirds laid their eggs in the nests of species adapted to finding food without the bison. People decimated the bison, but the cowbirds didn’t disappear because people also burned off and plowed the prairies, making the cowbirds’ food available even without the heavy-hoofed mammals. 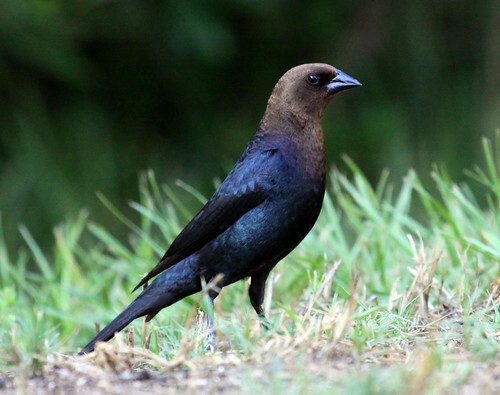 So the cowbirds survived and spread, to endanger many birds that had never before had to deal with cowbirds. Thus the ecological problems cowbirds cause were originally caused by people. To understand cowbird issues more clearly, see here.